This post is continuing with my 10 Fairy Sketches challenge. I got motivated over the weekend, so here are Fairy sketches #2, #3, #4, and #5. Fairy # 3. I’m having a hard time coming up with a name for her. What do you think? I sketched all of them in my bound sketchbook (which is filling up fast) with a pencil. I took a break from sketching today to paint. So I will get back to sketching tomorrow. 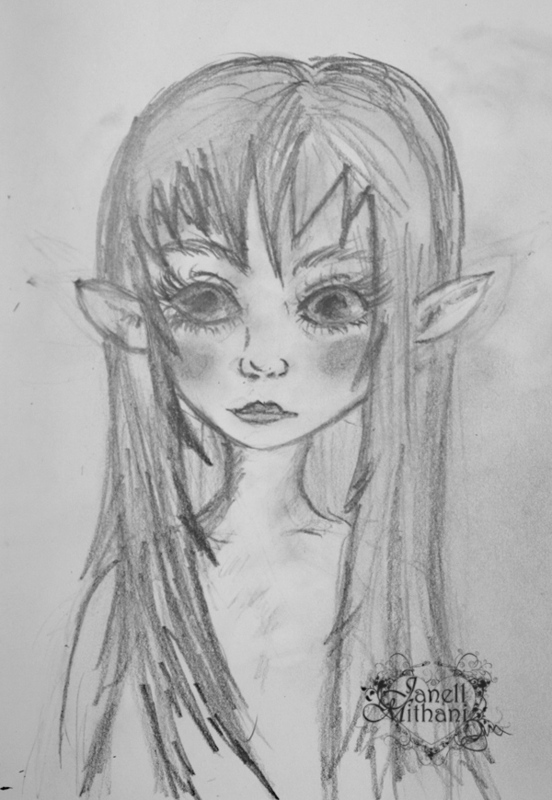 This entry was posted in Art, Art and Women and tagged big eyes, fairy, Manga, sketch. Bookmark the permalink. Love your Fairy sketches…love you!! These are terrific, Janell. I love the big eyes! 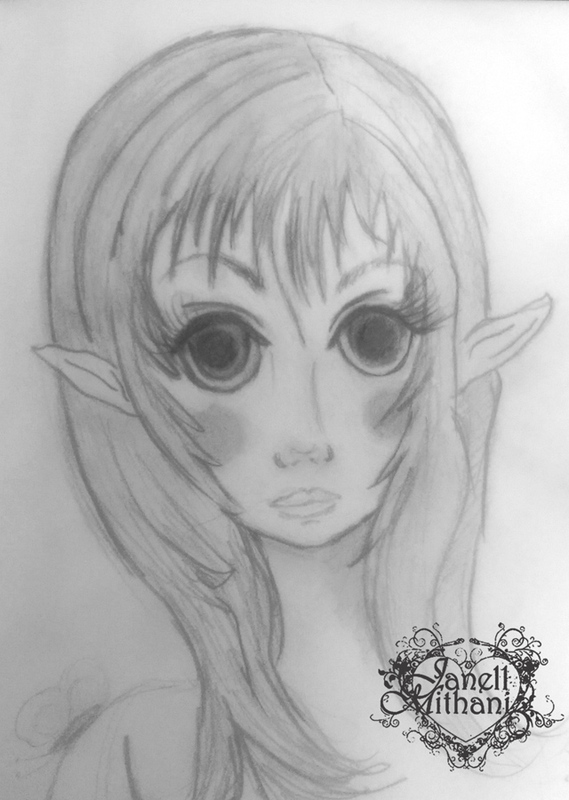 These a wonderful little fairies Janell, all different with different personalities. My favorite is “Laurel”, she has the biggest eyes and eyelashes ever and a gorgeous, beautiful face, she softens my heart if I look into her eyes! “Dream” is the first fairy with closed eyes I have seen till now, her name is perfect. The “Young One” is super cute with her tiny features, totally innocent. The “no name” looks very sure of herself and charming with the fullest lips ever, I name “Charm”. Delightful, gorgeous fairies! Laurel is my favorite! For the fairy with no name, have you ever named one “Bright” or “Fawn”? Thanks, Jill. 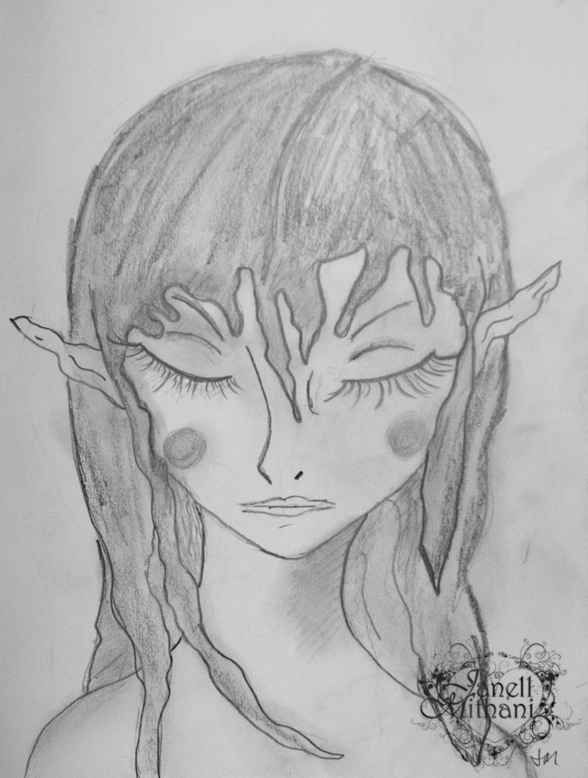 Teaching manga and anime art to teens has certainly influenced my art. Thanks so much for your comments, Eva. I love the name Charm! 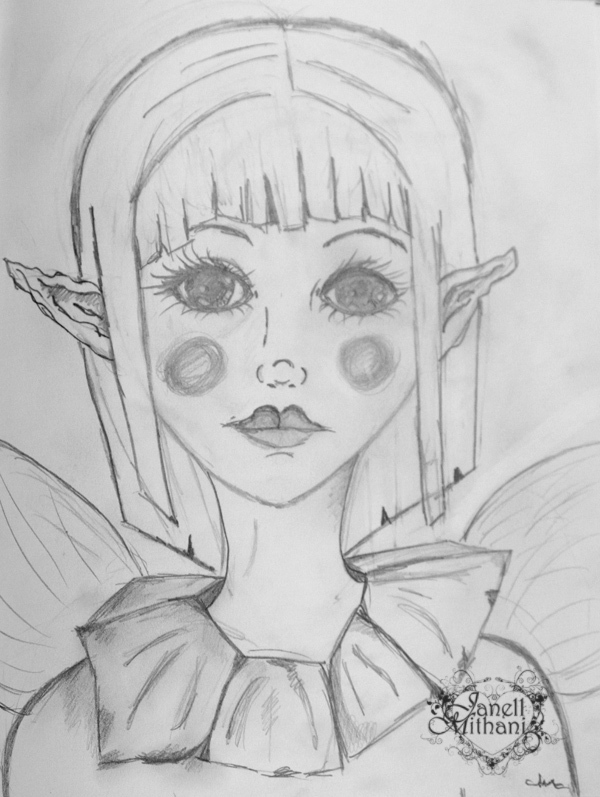 I am certainly enjoying sketching these fairies! Love your fairies Janell – each carry their own delicate structures and personalities. I like Eva’s “Charm,” seems to fit the no-name character perfectly. You’ve been busy. Thanks, Mary. Yes, I had a pretty productive weekend. I hope it continues! Love them all, especially the unnamed one. She looks as if she is waiting for something; I certainly don’t know what. She also looks young. I common name that popped into my head is Bella, because she is most beautiful. You’re on a roll Janell, there’s no doubt that you’ll keep on producing these special fairies! Thanks, Sheila. I love the name Bella, too. I remember her now, that’s probably why the name was fresh in my mind! You have a nice set of fairies going on! Seems like you also have some great possible names for #3. I’m going to suggest Tria in honor of her number. Thanks, and I like the name Tria. That would be a good tree fairy name, too. I think she is adorable. Maybe call her Trixie. They are beautiful! They remind me of the Margaret Keane “big eyes” paintings! A NAME FOR #3…HEIDIE…AS IN THE STORY ABOUT THE LITTLE GIRL? Well….I think she has that sort of character in looks.